Watching movies with families and kids is a favorite on Thanksgiving. So what's on the movie calender for Thanksgiving this year? If you don't know what to watch, here we have list 2018 best Thanksgiving moveis for kids. Have fun. Thanksgiving is approaching rapidly, will kids veg out watching Macy's Day Parade or play outdoors as usual? Unfortunately, cold weather often prevents children from going outside. Alternatively, indoor activities are more preferred. So thanksgiving movies are a perfect fit for kids to spend the time. Here are top 10 best Thanksgiving movies for kids, from 2018 new Thanksgiving animated movies for kids to most classic ones, to get them into the spirit of the festival. Not only are the Thanksgiving family movies entertaining, but they also teach kids a few things about the true meaning of Thanksgiving. * Free download movies, trailers, soundtracks, other content from 1000+ movies sites like YouTube, Vimeo, Facebook, Dailymotion (when it is allowed to). * Convert downloaded movies to hevc, mp4, mov, avi, mkv, 3gp, mp3, or iPhone XS/XR/X/8, Galaxy S9, Note 9, other latest mobiles. * Extremely fast movie download speed with excellent movie quality. * 100% safe and free of any virus, malware or other built-in programs. 2018 Disney's new animated movie is definitely a must-see movie for kids on Thanksgiving. First, the movie has a lot of fun, exciting and visual-stunning scenes. More importantly, there are more emotional parts as well as the deeper dig into the dark side of the internet. Early viewers are deeply impressed by the movie, putting it on par with the first one. The Grinch is another good movie for Thanksgiving holiday that is suitable for kids. The movie is based on the favorite character of children's book How the Grinch Stole Christmas! Voiced by Benedict Cumberbatch, the animated version just comes right in time for the holiday. Don't hesitate to download the Thanksgiving movie trailer to see if your kids would like it. Do kids love princess and wonderworld? I bet most kids do, especially for young children and girls. Disney's other movie The Nutcracker and the Four Realms is another option for the family movie night on Thanksgiving. Though the movie has received some bad critics, Disney production is a brand promise. Thanksgiving is all about family, why not watch the movie of the favorite family of superheroes - Incredibles 2. This time, the mom will go out to fight against the bad guys and the dad is left home taking care of the baby. The movie scores the second highest grossing animated of all time and lives up to the original. A can't miss movie to watch with kids on Thanksgiving. One of the best Hollywood movies for kids to watch. If you missed the movie on theater, it's a good time to watch the 2016 best movies for kids this Thanksgiving and experience a wonderful animated adventure with your children. You can download Disney Zootopia from movie sites online or buy the DVD and copy it to iPhone iPad Android mobile devices, Apple TV etc. to watch in a convenient way. Want your kids to be quiet? Coco that tells a simple and heartwarming story of a little boy Miguel 's struggle to proven his music talent, is one of the best Thanksgiving movies for kids to watch. Your kids will be impressed by the colorful and beautifully animated scene, multi-instrumental skeletons and movie soundtracks. When it comes to the Thanksgiving movies for kids, The Star from Sony Picture Animation is a must-watch. "With a great voice cast and cute character animation, the movie is funny and entertaining enough", which is the right choice for kids and families to watch on Thanksgiving day or Christmas Day. Trolls from DreamWorks Animation is no doubt the best 2016 thanksgiving movie for Kids to watch. It was released out on November 4, 2016, and directed by Mike Mitchell and Walt Dohrn. Trolls is an "ecstatically happy movie", and the "giddy EDM kiddie musical" from the top Thanksgiving film will amuse your kids. This isn't a classic movie for kids and family to watch at Thanksgiving. However, the 3D computer-animated superhero comedy film Big Hero 6, set around Thanksgiving Day, is indeed an impressive kids-friendly movie that features the heart-warming Baymax. If you want your kids to be more considerate, just join the movie for your kids into Thanksgiving movies list. Inside Out is actually not the movie set around Thanksgiving. But it's undoubtedly the best movies for kids to watch at Thanksgiving because the Disney-made film is all about a young Riley'semotions, from which your kids may learn joy, fear, anger, disgust, and sadness in their life. Click here to copy DVD inside out and watch the Thanksgiving movie with kids. A movie, though with the whole Santa Claus theme, takes place on Thanksgiving day at the Macy's parade in New York. There are several versions of this Thanksgiving movie but the classic released in 1947 is still the best. No matter how many times you see it, this Thanksgiving movie is a truly heart-touching movie and a perfect way for kids to kick off the season at Thanksgiving. A blockbuster about Mayflower's smallest traveler. Though little known and not a top-notch, this movie is surely one of the top thanksgiving movies that offer the best way to entertain children and give them a good lesson about the history of Thanksgiving while preparing Thanksgiving feast. Seasons of Giving - A top Thanksgiving movie for kids with classic Pooh tale. To prepare the Thanksgiving dinner, Winnie the Pooh, Piglet and Tigger plan to find the proper ingredients. This is a typical movie for Thanksgiving day, offering kids a nick lesson that they shall be grateful for what they have. For kids who want to roar with laughter while enjoying movies, Planes, Trains and Automobiles is absolutely suitable family entertainment. This comedy movie stars Steve Martin and John Candy, so rest assured that all you will get from this movie is laughter. This Thanksgiving movie utilizes the age-old theme of two decidedly different people becoming inseparable from each other and learning to get along. Supposing that the minor offensive segments are removed, this Thanksgiving film is worth a try by kids in Thanksgiving season. An Emmy award-winning special that tells the story of Thanksgiving with the Peanuts gang, with Charlie Brown in charge of the Thanksgiving dinner where everyone drops by unexpectedly. This is one of the best Thanksgiving movies for kids and is also a classic Thanksgiving tradition that has been enjoyed by children since 1973. You could find these thanksgiving cartoon movies for kids from YouTube or rent from DVD store for your kids in advance. 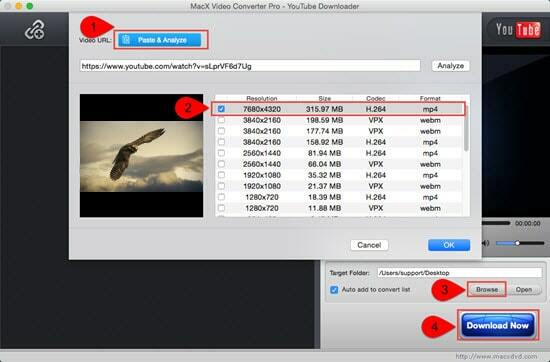 For those who want to download these thanksgiving movies for children from YouTube, MacX Video Converter Pro offers you the best choice. It can download these wonderful Thanksgiving family movies from YouTube, Facebook, Dailymotion, Vimeo, and 1000+ online sites so that you can watch them with your kids offline while preparing Thanksgiving recipes or having dinner at the table without worrying slow speed network or spotty connection. Alternatively, you can also make a copy of Thanksgiving-themed DVDs from those rented from DVD store by means of MacX DVD Ripper Pro to better view it with your kids during this thankful season or even in the next year's Thanksgiving. It's worth noting that the best DVD ripper for Mac supports to copy new movies on DVDs, but please abide by the local laws before copying commercial DVDs. Free Download & Convert 4K UHD Movies to 4K TVs, Computers, Mobiles and More!